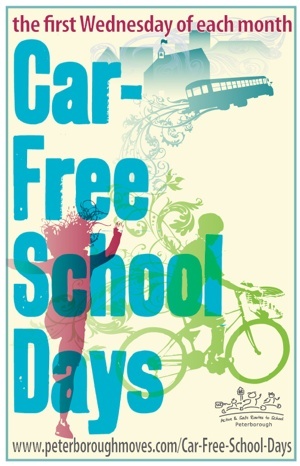 Don't forget that today is a Car-Free School Day. The first Wednesday of each month, Peterborough Moves encourages you to enjoy some fresh air and walk to school. For more information about Car-Free School Days, or to register your school for a program package (and chances to win monthly prizes), please contact Maeda Welch at Peterborough Green-Up, (705) 745-3238 ext. 216, or by email.